This article has some truth that actually happened many years ago but most of the article is hypothetical and completely fabricated by yours truly. However it is a serious attempt to get an answer to the question raised above. It is not often mentioned but there are some private Japanese Koi enthusiasts who have studied Koi for many years and many of these guys are equally as cute in finding and buying world-class tategoi as are some of the most famous Koi breeders in Japan. These guys will travel anywhere in Japan if they get a hint on the grapevine that so-and-so has a Koi that’s worth a closer look. The above is factual and so is the next part. I met one such man in the autumn of 1987 at the premises of a very large and well-respected Koi breeder. I was escorting a large party of BKKS members there where we would spend the entire day looking at the thousands of Koi offered for sale. He was a middle-aged man dressed like one who was possibly middle management of a bank or building society and was sitting on a wall watching with some surprise as this procession of thirty foreigners exited the coach. There were so many freshly-harvested Koi to look at in many ponds that were housed in several buildings. So I suggested it would be best if I stayed near the coach so that anyone in the party would know where to find me should they need to ask questions or make a purchase. Soon after, the man and I started to make communications with each other. After the usual stuff that we were not from the USA but the UK and that we had travelled so see and buy Koi. I then tried to find out what he was doing there and why no-one at the Koi outlet had come to assist him. He brushed it all aside saying it was a nice day and he could wait, he then produced a pack of Polaroid photos from a small bag he was carrying. He hastily put the photos in some kind of order then showed me the first one saying ‘Sansai 49cms’ then pointed to himself. Eventually, after further explanations I realised he had bought the Koi from this farm some four years ago for 500,000yen (then £833.00 – now £3,906.00). I looked at the picture but all I saw was a ‘nice’ Sanke – nothing I would consider buying at that price. 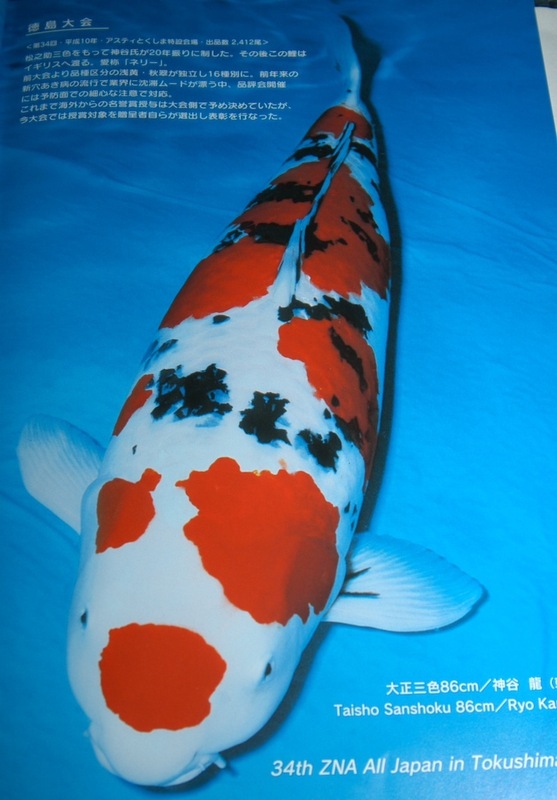 He then mentioned he’d paid the breeder a further 50,000yen (then £83.00 – now £390.00) to grow her for another year and then showed me the next picture when the Koi was one year older and measured 63cms. No doubt, the Koi looked vastly improved from the first picture. To save time he showed me the next shot at 73cms and the next shot sent to him by the breeder some days ago when the Koi was then 80cms. He had yet to see the Koi with his own eyes as it had just been harvested but the shot I saw was of one of the most magnificent Koi I’d ever seen in my life! The man had paid the annual growing costs and now he had finally come to collect the Koi from the breeder. He then mentioned that the breeder had phoned him and offered to buy the Koi back from him for 5,000,000yen (£8,300.00 then, now £ 39,000.00) but he had politely refused and perhaps because of this refusal his Koi would not be packed until the end of the day as the staff were ‘busy’ looking after the visitors from the UK. In short, the miffed breeder had decided to make him wait! He waited patiently and had even brought a lunch box with him but eventually, in late afternoon; his Koi was found and placed in a large bowl whilst the staff prepared the packing box. The gasps from the UK party after seeing the Koi – including my own, are difficult to explain but I knew there and then it was the very best Koi I’d ever seen with my own eyes to that date! Soon after the Koi was loaded in the back of a modest-priced car and the man drove her away. This ends the ‘truth’ part of the article and here starts the hypothetical part. Just imagine the date when the man drove away was late October 2012 and the Koi was 98cms, which is a reasonable assumption today as growth rates achieved today have increased significantly since 1987. The man then drove the Koi to Komaki and had pre-arranged with Narita san to offer her for sale in his best pond and would give Narita san a good commission if a sale were made. The question now arises that the owner is an amateur and the Koi has a good chance of taking number one at the All-Japan – so why doesn’t he simply enter her under his own name? Whatever, but if the Koi is as good as I describe then it would overshadow all the other world-class Koi in Narita san’s number one display pond and trust me, within days, every Koi breeder and dealer in Japan would know about it! The All-Japan show is now only three months away and the owner is desperately seeking a buyer who can pay the money, enter it into the show and then walk away with the trophy and certificate that states he owns the very best Koi in the world. Now we’re into the realms of pure conjecture here but let’s imagine there are three people in the world who have the wherewithal and a burning desire to see the records state that they owned the very best Koi in the world as of 2013. There’s now only a few days left before the Koi can be entered into the show and the owner is still in negotiations with each of the three interested parties. OK, let’s say he accepts the offer from the highest bidder which happens to be £190,000.00. Then let’s assume that all the advance predictions were correct and the Koi easily takes the coveted Supreme Champion award and the new owner now has his name recorded for posterity in the record books. To re-cap, the man has paid £190,000.00 only two days before entries to the show had closed and now owns the very best Koi on the planet. The Koi is then taken back to the breeder’s ponds to be rested and cared for. So only three days after he’s paid for the Koi and it’s proven itself to the world, what now would you seriously estimate the value to be if the new owner wishes to sell it? Also, why did the owner choose not to enter the Koi under his own name? Here are my views on this and I’ve had these same views for some years now. At the end of all of this, the brutal truth is that the Koi in question has no significance whatsoever in all of this farce – the Koi itself was simply the means to an end for the seller, the owner AND Shin-Ko-Kai – let’s not forget Shin-Ko-Kai here. Even the photos taken on stage at the lavish presentation ceremony with the huge (shop-bought) trophy and all the applause and associated razzamatazz are also completely meaningless. The only single reason the owner took a huge gamble and paid a huge sum of money for the Koi was the dream that the Koi would take the Supreme Champion award. Because then, and only then, would HIS name be printed on the official CERTIFICATE to confirm the fact and the records documented by Shin-Ko-Kai would also substantiate and cement all of this as if it were carved in stone. As to the reason as to why the genuine owner of the Koi chose to sell instead of entering under his own name, well that’s simply because HIS NAME would be on the certificate and very few guys with the necessary wherewithal wish to buy ‘shop-soiled, second-hand goods’ especially without THEIR name on a certificate. As to the value of the best Koi in the world AFTER the show? Well, I bought the Supreme Champion of a ZNA All-Japan show, only 5 months after she had taken the award. I have no idea how much the owner paid for her but I paid £36,000.00 and considered it to be an absolute bargain! That particular Koi would have taken Supreme at any Koi show in the world in those days and probably even would today with knobs on, but she didn’t cost anywhere near to £190,000.00 even with my huge profit margin on top! The value of the best Koi in the world AFTER it has been given the award bears no relationship at all to the price paid BEFORE the show. Today, the chances of any Koi taking the Supreme Champion award at the All-Japan show more than once are almost unthinkable because all of today’s Champions are almost at their very peak as far as showing is concerned – and there are many others being groomed to ‘perfection point’ in the hope of taking the award 12 months down the line. Only very few of these current Champions would ever be considered by breeders to be future parent Koi material and even if a few were, the prices offered would be a pittance in relationship to the actual price paid for the Koi. Now, if the real truth is known, even the lowliest-priced Koi available right through to the highest-priced Koi possible are all based upon ‘dreams’ of the future owners – that’s if you think about it VERY carefully. And this all revolves ultimately around Koi shows and the awards given plus those dreams dashed or realised. I’ve known all this for more years than I care to recall, but in the case of The All-Japan Show that is staged annually by the Koi breeders, Koi dealers and Koi Agents of Japan collectively known as ‘Shin-Ko-Kai’, isn’t RIGHT NOW about the time all these guys should be digging hands in pockets and collectively stumping up £100K for the owner of the Koi that takes Supreme Champion award from now on? After all, the Koi in question IS the finest Koi on this planet at that particular moment in time. So ‘Mr. Shin-Ko-Kai’ – you and I both recall the days when 95% of the visitors to your All-Japan show were Japanese enthusiasts. That’s no longer been the case for many years and I’ll take a guess that at the 2013 show there will be 95% of the visitors attending from overseas. I suggest you look after them because that’s where your livelihood comes from today. Take it from me; unless something is done pretty soon, even the prized paper certificates will also become absolutely meaningless!